Who is with you on your journey? Be in a relationship with, be in partnership with, be in business with, spend time with, associate with only those who bring out and expect your best. Those who believe in you and love you unconditionally. Those who raise you up. Those who challenge you to do better, be better and feel better—to reach farther, climb higher, go deeper. Our sphere of direct influence can be a source of confidence, motivation, inspiration, validation and support. Or, it can be a source of fear, judgment, competition, pain and suffering. Let go of anyone who creates a consistent negative response in you and expends your energy. Bring along only those who create wellbeing and expand your energy. Create the perfect matches in traveling companions. 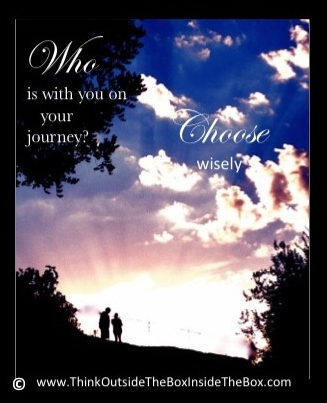 Choose wisely who is on the journey with you. You control who walks with you. Kelli, you lovely writer! I married my partner in crime (art), my inspiration! I believe you are as successful as your 5 closest friends! And the most loving thing we can do is forge ahead and show our loved ones that a life spent creating is worth it!